When I decided to quit trudging through life in a perpetual work -commute-weekend chores-church-work cycle, it became something of a mission to find a hobby, activity, or project, that a fifty-one year old man could enjoy. It’s even more of a challenge with a perpetual dearth of money. Exercise costs very little so it is a favorite. Or more recently, hiking. Now I am in decent shape, as I go to the gym. sometimes less frequently that I should, but in the last two years I routinely have been to the gym for an hour or so three times a week. But there is something about being outdoors and away. I have (re)discovered hiking. Day hikes such as one I spent this morning. I decided to start by hiking the county parks in the East County. 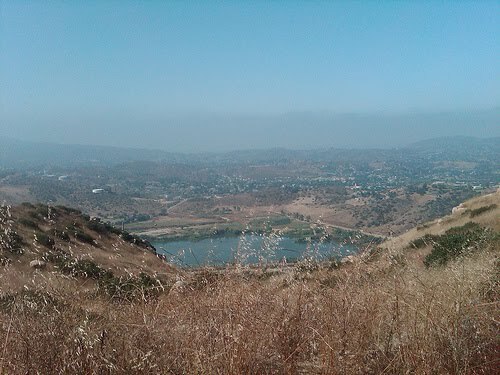 I have been to Flynn Springs several times, and to Lindo Lake, but I let Google discover that I had never been to Louis Steltzer County Park in the East County which was closer somewhat than driving out to Ramona or to Torrey Pines State Beach So my dog Sydney and I hiked to the Steltzer summit trail this morning. It was a decidely modest-exercise hike – until the final third of a mile to the summit which probably was the most heart-pounding exercise I had outside of the gym elliptical machine this year. Previous Article "Fair Winds and Following Seas"
Next Article Not quite Dead Yet!